Louis Stokes was born on February 23, 1925, in Cleveland, Ohio, to Charles and Louise Cinthy (Stone) Stokes.2 His father worked in a laundromat and died when Louis was young. Stokes and his younger brother, Carl, were raised by their widowed mother, whose salary as a domestic was supplemented by welfare payments. The boys’ maternal grandmother played a prominent role, tending to the children while their mother cleaned homes in wealthy white suburbs far from downtown Cleveland. Years later, Louise Stokes recalled that she had tried to instill in her children “the idea that work with your hands is the hard way of doing things. I told them over and over to learn to use their heads.”3 Louis Stokes supplemented the family income by shining shoes around the Cleveland projects and clerking at an Army/Navy store. He attended Cleveland’s public schools and served as a personnel specialist in the U.S. Army from 1943 to 1946. Much of his tour of duty was spent in the segregated South, driving home for Stokes the basic inequities facing blacks—even those who wore their country’s uniform.4 He returned home with an honorable discharge, taking jobs in the Veterans Administration and Treasury Department offices in Cleveland while attending college at night with the help of the GI Bill. He attended the Cleveland College of Western Reserve University from 1946 to 1948. Stokes eventually earned a J.D. from the Cleveland Marshall School of Law in 1953 and, with his brother, opened the law firm Stokes and Stokes. On August 21, 1960, Louis Stokes married Jeanette (Jay) Francis, and they raised four children: Shelly, Louis C., Angela, and Lorene. At his brother Carl’s behest Louis Stokes made his first run for elective office in 1968. He sought to win the seat in the newly createdcongressional district that encompassed much of the east side of Cleveland—including Garfield Heights and Newburgh Heights—where African Americans accounted for 65 percentof the population. Stokes was hardly a typical newcomer to the political campaign. First, his brother, Mayor Stokes, put the services of his political network at Louis’s disposal. “I ran my brother Louis,” Carl Stokes recalled, “and put behind him all the machinery that just elected me mayor.”9 With Carl’s help, Louis cofounded the Twenty–First Congressional District Caucus—a political organization that would serve as his base throughout his long congressional career. It provided the supporters, volunteers, and organizational structure that sustained Stokes in the absence of support of the local Democratic machine; it was a loyal cadre that would do everything, from stuffing envelopes and knocking on doors to holding an annual picnic that became a highlight of the community’s annual calendar. 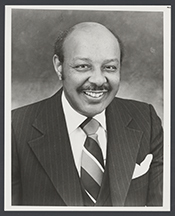 The caucus fulfilled Stokes’s twin representational goals: to develop black political power in Cleveland and to inspire black pride among his constituents.10 Finally, Louis Stokes’s credentials within the black community were sterling. He won two vital endorsements: the support of the Call & Post, the influential local black newspaper, and the backing of the vast majority of the local church ministers in the new district. During his second term in the House, Stokes earned a seat on the powerful Appropriations Committee, with oversight of all federal spending bills. This exclusive assignment required him to relinquish his other committee assignments. During more than two decades on the committee, Stokes steered hundreds of millions of federal dollars into projects in his home state. He eventually became an Appropriations subcommittee chair, or “cardinal,” for Veterans, HUD, and Independent Agencies—controlling more than $90 billion annually in federal money.18 Stokes was the second African–American “cardinal” ever (the first, Julian Dixon of California, chaired the DC Subcommittee). Years later, Stokes said of the Appropriations Committee, “It’s the only committee to be on. All the rest is window dressing.”19 In addition to chairing an Appropriations subcommittee, Stokes is one of fewer than two dozen African Americans ever to chair a House committee and one of just a handful to wield the gavel on multiple panels: the Permanent Select Committee on Intelligence (100th Congress), the Committee on Standards of Official Conduct (97th–98th Congresses, 102nd Congress), and the Select Committee on Assassinations (95th Congress). Using his position as CBC chairman and his increasing influence on the Appropriations Committee, Representative Stokes pushed a legislative agenda that mirrored the needs of his majority–black district. He earned a reputation as a congenial but determined activist for minority issues, consistently scoring as one of the most liberal Members of the House in the Americans for Democratic Action and the American Federation of Labor and Congress of Industrial Organizations vote tallies. He advocated more funding for education (particularly for minority colleges), affirmative action programs to employ more blacks, housing and urban development projects, and initiatives to improve access to health care for working–class Americans. In the 1980s, Stokes vocalized black concerns that the Ronald W. Reagan administration was intent on rolling back minority gains made in the 1960s and 1970s. He described conservative efforts to scale back school desegregation efforts and affirmative action programs—as well as massive spending on military programs—as a “full scale attack” on the priorities of the black community.24 He also was an early advocate of federal government intervention in the fight against HIV/AIDS. In January 1998, Stokes announced his retirement from the House, noting that he wanted to leave “without ever losing an election.”31 He conceded that politics had lost some of its appeal since his brother Carl’s death from cancer two years earlier. “We used to talk every day. We could run things by one another,” he recalled. “We could think and strategize on political issues. I guess without him here, it really has taken away a lot of what I enjoy about politics. It’s not the same.”32 Moreover, a new generation of rising black politicians in Cleveland was displacing those of Stokes’s generation.33 Among his proudest accomplishments as a Representative, Stokes cited his ability to bring Appropriations Committee money to his district to address needs in housing and urban development and the opportunities that allowed him to set “historic precedents” as an African American in the House.34 “When I started this journey, I realized that I was the first black American ever to hold this position in this state,” Stokes told a newspaper reporter. “I had to write the book … I was going to set a standard of excellence that would give any successor something to shoot for.”35 As his replacement, Stokes supported Stephanie Tubbs Jones, an African–American judge and a former prosecutor who prevailed in the Democratic primary and easily won election to the House in 1998. After his congressional career, Louis Stokes resumed his work as a lawyer in Silver Spring, Maryland. Stokes died on August 18, 2015. He lay in state in Cleveland City Hall on August 24. 1Richard F. Fenno, Going Home: Black Representatives and Their Constituents (Chicago: The University of Chicago Press, 2003): 22. 2“Louise Stokes, Mother of Congressman and Mayor,” 13 February 1978, New York Times: D8. 3David Hess, “She Urged Sons ‘To Be Somebody,’” 16 December 1968, Christian Science Monitor: 6. 4Tom Brazaitis, “Stokes Era Comes to End,” 18 January 1998, Cleveland Plain Dealer: 1A. 5Congressional Directory, 91st Congress (Washington, DC: Government Printing Office, 1969): 141. 8Kermit L. Hall, The Oxford Companion to the Supreme Court of the United States (New York: Oxford University Press, 1992): 865–866. 11Roldo Bartimole, “Negroes’ Election in Nonwhite Areas Isn’t Automatic, Cleveland Race Shows,” 6 May 1968, Wall Street Journal: 12. 14William L. Clay, Just Permanent Interests: Black Americans in Congress, 1870–1991 (New York: Amistad Press, 1992): 113–114. 15“Election Statistics, 1920 to Present,” available at http://clerk.house.gov/member_info/electionInfo/index.aspx. 17Politics in America, 1994 (Washington, DC: Congressional Quarterly Inc., 1993): 1204. 18An allusion to the “College of Cardinals,” who elect and advise the Pope of the Roman Catholic Church, the cardinal title is meant to convey the power and authority vested in the handful of Appropriations Committee Members who shape federal expenditures. At the time, Stokes was one of 13 Appropriations subcommittee chairs. 22Paul Delaney, “Rep. Stokes Heads the Black Caucus,” 9 February 1972, New York Times: 23. 23Marguerite Ross Barnett, “The Congressional Black Caucus,” Proceedings of the Academy of Political Science 32 (Volume 1975, Number 1): 39–40. 24Jeffrey M. Elliot, Black Voices in American Politics (New York: Harcourt Brace Jovanovich 1986): 40–41. 25Politics in America, 1990 (Washington, DC: Congressional Quarterly Inc., 1989): 1206. 26See, for example, Gerald Posner’s Case Closed: Lee Harvey Oswald and the Assassination of JFK (New York: Anchor Books, 2003); Vincent Bugliosi’s Reclaiming History: The Assassination of President John F. Kennedy (New York: W. W. Norton &amp; Co., 2007); and Taylor Branch, At Canaan’s Edge: America in the King Years, 1965–68 (New York: Simon and Chuster, 2006). 27George Lardner, Jr., “JFK–King Panel Finds Conspiracy Likely in Slayings,” 31 December 1978, Washington Post: A1. 28See, for example, Politics in America, 1994: 1203; Fenno, Going Home: 181. 29Politics in America, 1996 (Washington, DC: Congressional Quarterly Inc., 1995): 1043; see also Politics in America, 1994: 1203–1205. 30Politics in America, 1998 (Washington, DC: Congressional Quarterly Inc., 1997): 1140–1142; quote on 1140. 31“Louis Stokes, Ohio Democrat, Plans to Retire from Congress,” 18 January 1998, New York Times: 23; Tom Brazaitis and Sabrina Eaton, “Rep. Stokes to Retire; Congressman Won’t Seek Re–Election; Clevelander Rose From Poverty to Heights of Power,” 17 January 1998, Cleveland Plain Dealer: 1A. 33Politics in America, 1994: 1204. Papers: Dates and amount unknown. Congressional papers of Louis Stokes. Papers: In the National Association for the Advancement of Colored People Cleveland Branch Records, ca. 1924-1967, 27.5 linear feet. Persons represented include Louis Stokes. Papers: In the Carl Stokes Papers, 1957-1972, 104.51 linear feet. The papers include material relating to Carl Stokes's brother, Louis Stokes. Exhibit: A virtual exhibit titled, "Carl & Louis Stokes: From the Projects to Politics,": http://www.stokescleveland.org/. Oral History: 2007, amount unknown. An oral history interview of Louis Stokes conducted on February 7, 2007. Oral History: In the Ralph J. Bunche Oral History Collection, 1973, 17 pages. An interview with Louis Stokes by Edward Thompson III on March 14, 1973. In the interview, Louis Stokes discusses his reasons for entering politics, as well as the Congressional Black Caucus, including its origin and goals, and divisions within the group. Also discussed is Louis Stokes's relationship to President Nixon's Administration, the Black National Political Convention in Indiana (1972), and Black support of Democratic and Republican presidential candidates. Papers: In the Hazel Collister Hutchison and Clark Livensparger Papers, 1920-1984, 9 cubic feet. Correspondents include Louis Stokes. Papers: In the Sierra Club National Legislative Office Records, 1960 - on-going, 200 linear feet. Persons represented include Louis Stokes. Papers:: In the Washington Office on Africa, Addendum B Records, ca. 1970-1996, 35 linear feet. Persons represented include Louis Stokes. "Louis Stokes" in Black Americans in Congress, 1870-2007. Prepared under the direction of the Committee on House Administration by the Office of History & Preservation, U.S. House of Representatives. Washington: Government Printing Office, 2008. Ralph Nader Congress Project. Citizens Look at Congress: Louis Stokes, Democratic Representative from Ohio. Washington, D. C.: Grossman Publishers, 1972. Stokes, Louis, with David Chanoff. The Gentleman from Ohio. Columbus: Ohio State University Press, 2016.